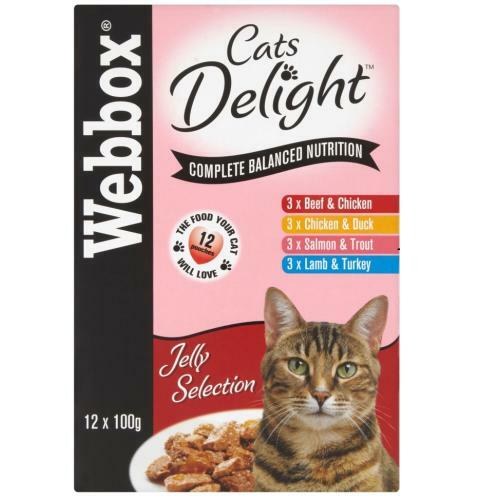 Webbox Cats Delight Selection in Jelly are a complete food for adult cats. Available in a pack of 12 pouches containing the following flavours: Beef & Rabbit, Chicken & Turkey, Duck & Lamb and Salmon & Trout. Beef & Rabbit: Meat and animal derivatives (min 5% beef, min 5% rabbit), minerals, various sugars.Chicken & Turkey: Meat and animal derivatives (min 5% chicken, min 5% turkey), minerals, various sugars.Duck & Lamb: Meat and animal derivatives (min 5% duck, min 5% lamb), minerals, various sugars.Salmon & Trout: Meat and animal derivatives (min 5% salmon, min 5% trout), minerals, various sugars. Crude Protein 8%, Crude Fibre 0.3%, Fat Content 4.5%, Crude Ash 2.5%, Moisture 82%. Nutritional Vitamin D3 250iu, Vitamin E 15mg, Copper sulphate 1mg.